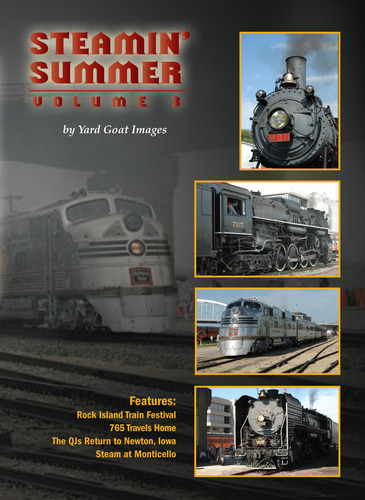 Rock Island Train Festival - Days 3 & 4 - This one-time event brought together 7 steam locomotives, historic and modern diesels and more to a Mississippi River site in Rock Island, Illinois. The festival featured daily steam trips to Walcott, Iowa and all-day trips to other destinations pulled by steam and diesel. This chapter features QJ 6988 with an all-day run to Iowa City and QJ 7081 on two Walcott, Iowa trips on Day 3. Day 4 coverage begins with the historic diesel-powered Nebraska Zephyr train-set on an all-day journey to Bureau Junction, Illinois and the afternoon Walcott trip. Festival ground action includes late Day 4 locomotive movements as trains are made up for journeys home for 765 and the QJs. 765 Travels Home - we spend the day with the beautiful Lima as it travels across Illinois to Logansport, Indiana with its passenger consist. The scenery is great and the locomotive and crew puts on a great show! The QJs Return to Newton, Iowa - we take you on a high speed chase across Iowa as the QJs double-head home carrying two Iowa Interstate business cars and a short freight train following the Festival. Steam at Monticello - we visited the Monticello Railway Museum on a warm August weekend. We came to see Southern 401, a 2-8-0 built in 1907. On display at the museum since 1971, it returned to steam in 2010 and operates one weekend per month. The museum has a HUGE collection of operating diesels, freight and passenger cars, and a lot of track to on which to operate. Steamin' Summer Volume 3 DVD - Yard Goat Images from Yard Goat Images on Vimeo.